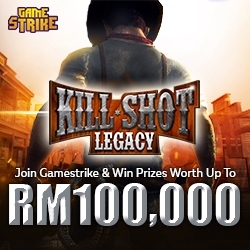 Kuala Lumpur, Malaysia, June 08, 2018 –(PR.com)– Gamestrike today launches “Kill Shot Legacy” and exclusively offers a total RM100,000 worth of prizes to Digi customers. “Kill Shot Legacy” is an intense first-person shooting game that takes place across different timelines including the Old West, an Alien Zone, Military Base and the Future. The game can be easily participated in by casual to expert gamers. Mobile gamers just need to gain a high score by gunning down bad guys and be placed on the leader boards to be in the running for cash prizes. With eight game mastery level challenges, players can expect a pack load of new contents and shoot it out within the next four months for the top leader boards once again. The next group of winners will go head to head and draw down for the grand prizes. Gamestrike continues to drive an awesome customer experience for mobile gamers. “Kill Shot Legacy” can be downloaded via Google Play and the iOS App Store.